Gastly's official artwork from Pokémon FireRed and LeafGreen. Gastly (ゴース, Ghos) is a fictional creature from the Pokémon games. Gastly's official artwork from Pokémon Red and Blue. 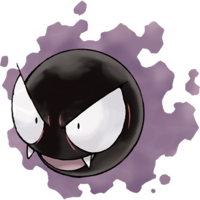 Gastly is a Ghost/Poison dual-type Pokémon introduced in Pokémon Red and Blue, and is categorized within the Pokédex at #092 as the "Gas Pokémon". It evolves into Haunter at level 25, which can then evolve into Gengar when traded with another player. They were the only Ghost-type Pokémon in the first generation games. Gastly and its evolutionary relatives can be found in various games in the wild in haunted areas, caves, and at night. Gastly's immunity to direct attacks in Smash is likely a reference to the Ghost type immunity to Normal- and Fighting-type moves in the Pokémon games. Gastly's sprite from Pokémon Red and Green. Villager next to Gastly in Smash Run. Gastly appears as a somewhat common enemy. It causes darkness damage on contact, and occasionally charges towards the player if close enough. Gastly is immune to all direct attacks, only taking damage from indirect ones, such as projectiles and other launched enemies. This Ghost/Poison-type Pokémon is made up of several toxic gases—touching it would be really unpleasant. Instead, try to take it out with projectiles. It's not the fastest enemy in Smash Run, but occasionally it may try to chase down a fighter, so be careful around this gaseous foe. In Smash Run, these Ghost- and Poison-type Pokémon tend to move slowly, and then, without warning, chase after you at high speed. You'll get hurt if they so much as come into contact with you, so be on your guard. As ghosts, they're immune to direct attacks. The only way to defeat them is to hit them with projectiles or items. If Gastly is hit with the KO Uppercut, it'll still make the noise despite dealing no damage. This page was last edited on April 5, 2019, at 16:30.